Ruling over an estimated 80 million people from Chang’an, China, the most populous city in the world, Emperor Ai of the Tang Dynasty is deposed by Zhu Wen, a military governor, after famines, marauding bandit armies, and a collapsing political structure leaves the dynasty vulnerable. 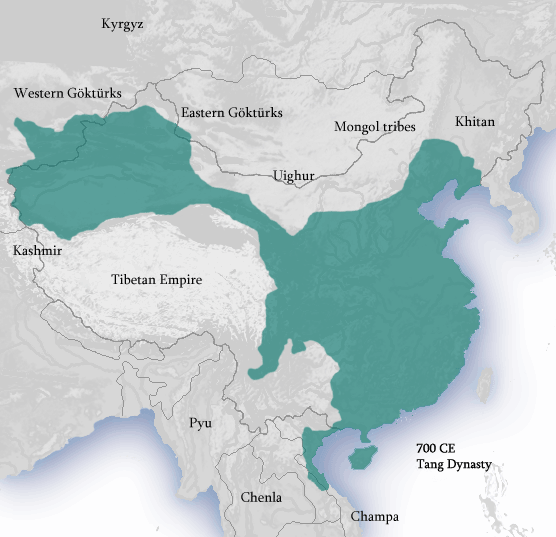 The Tang dynasty was an imperial dynasty of China preceded by the Sui dynasty and followed by the Five Dynasties and Ten Kingdoms period. It is generally regarded as a high point in Chinese civilization, and a golden age of cosmopolitan culture. Its territory, acquired through the military campaigns of its early rulers, rivaled that of the Han dynasty, and the Tang capital at Chang’an was the most populous city in the world. With a claim to the papacy backed by the Holy Roman Emperor, Pietro Rainalducci is consecrated as Antipope Nicholas V in Rome. His competing claim to head the Catholic Church will fizzle after he’s excommunicated by the reigning pope, and later “honourably imprisoned” for life. Nicholas V, born Pietro Rainalducci was an antipope in Italy from 12 May 1328 to 25 July 1330 during the pontificate of Pope John XXII at Avignon. He was the last Imperial antipope, that is, set up by a Holy Roman Emperor. 1310: He joined the Franciscan order after separating from his wife in 1310, and became famous as a preacher. 1328: He was elected through the influence of the excommunicated Holy Roman Emperor, Louis the Bavarian, by an assembly of priests and laymen, and consecrated at Old St. Peter’s Basilica, Rome, on 12 May 1328 by the bishop of Venice. 1328: After spending four months in Rome, he withdrew with Louis IV to Viterbo, but in December 1328 the papal legate Cardinal Orsini began a campaign against Viterbo and Corneto. 1329: Nicholas V was excommunicated by John XXII in April 1329, and sought refuge with Count Boniface of Donoratico near Piombino. 1330: Having obtained assurance of pardon, he presented a confession of his sins first to the archbishop of Pisa, and then at Avignon on 25 August 1330 to John XXII, who absolved him. 1333: He remained in honourable imprisonment in the papal palace, Avignon until his death in October 1333. Almost a year into their effort to isolate Germany’s capital after WWII, Soviet occupiers reopen supply routes to West Berlin. Over 200,000 flights delivering food and fuel to the blockaded city from the US, UK, and others had severely undermined the USSR’s expansionist plans. The Berlin Blockade was one of the first major international crises of the Cold War. During the multinational occupation of post–World War II Germany, the Soviet Union blocked the Western Allies’ railway, road, and canal access to the sectors of Berlin under Western control. The Soviets offered to drop the blockade if the Western Allies withdrew the newly introduced Deutsche mark from West Berlin.